We start off in January 1970 with our central character Nestor, a journalist recovering in hospital after being attacked by a knife-wielding murderer. 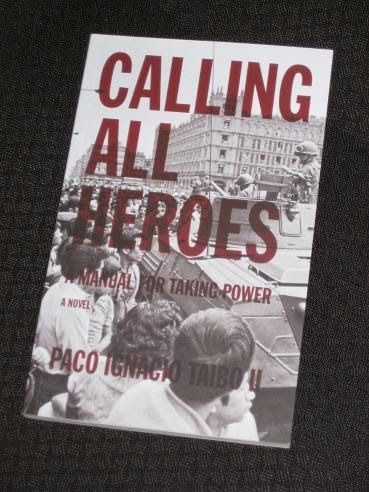 With time to think, he decides that the moment has come to make the government and the police pay for the atrocities committed during the Tlatelolco crackdown (or massacre…), and to this end he dictates a series of letters, summoning an army of legendary freedom fighters to Mexico City to carry out his quixotic mission. The actions of a deluded invalid? Perhaps… But what if all these heroes actually came? Calling All Heroes is a chaotic, adrenaline-charged story, initially confusing, but eventually simply exhilarating. The book consists of thirty-one short parts, alternating between two strands. In the first, an unknown narrator addresses Nestor in the second person, describing the events as the bitter journalist plots his attack on the unsuspecting authorities; in the second, letters to Nestor (letters he has requested) describe his character and history, also hinting at what happened in the crazy few days at the end of January 1970. Yep, that’s right – Mr. Stand-and-Deliver himself. It all makes for a wonderfully-entertaining and (more importantly) well-written story, a personal catharsis disguised as a Boys-Own yarn. The different strands work well, and a whole variety of voices come through in the letters Nestor receives from his friends. It won’t take you very long to finish Taibo’s book (an hour if you’re a quick reader), but it’ll stay with you a lot longer than that – revolution and comic-book carnage: what’s not to like? “Under these deplorable conditions, this shortest of novels was created. brewed in the midst of a premature divorce, following a premature marriage, of a political crisis, of an era of hunger and underemployment, the novel became a pretext, a vendetta, dealing with Power by other means. Paco Ignacio Taibo II is one of my favourite crime writers. His Private Investigator Héctor Belascoarán Shayne series is highly recommended if you want to read more by him. Thanks so much for this post! I haven't read Taibo yet although he used to be famous for his mysteries, but this sounds like a great intro to him and a fine read with or without the Bolaño parallels. Love the adrenaline rush sound/feel of the prose that you've described. By the way, Bolaño's novella Amulet also takes on the Tlatelolco massacre via its tale of a Uruguayan women locked up on the Mexico City campus while some of the worst outrages were being committed by the government. Using tanks against students would seem extreme in any country, I imagine. Guy – I'm not really one for crime novels, but you never know 😉 This one was short, witty and compelling, which bodes well for more. Richard – Ah, then I'll have to read 'Amulet' when I get the chance 🙂 Watch out for more Spanish-language lit later this week when I'm reviewing the new one by Andrés Neuman!